Wheels is a big butterscotch fan, but I’m not. 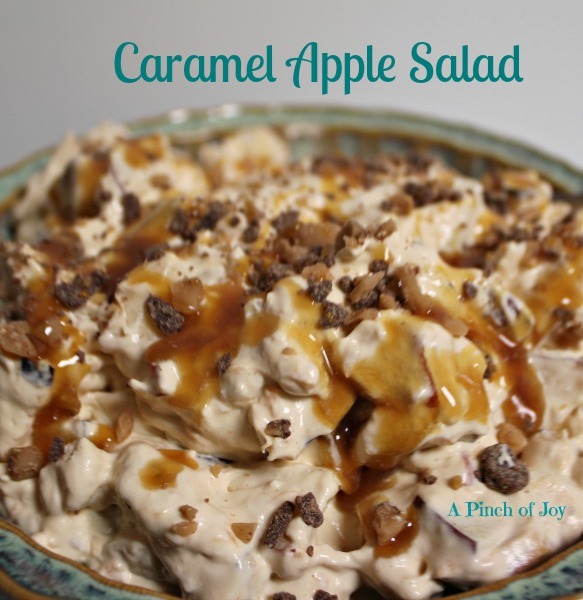 So I was more than a little skeptical when this recipe for Caramel Apple Salad came into my hands. Butterscotch pudding?? And pineapple?? This is really good, you’ll like it , my friend urged. She was right — I liked it! Of course, I had to tweak it a bit – can never leave a recipe as is! This is one of those so good it’s like dessert salads that are always a hit at potlucks and gatherings. I use sugar free pudding mix to cut back on the total carbs, but you can use any instant butterscotch pudding mix. For the same reason, I only use half the crushed pineapple called for in the original recipe. You do NOT taste the pineapple at all in this recipe. It provides the moisture for the dry pudding mix and a bit of texture. Cool Whip or other whipped toppings have negligible carbs/calories. And, of course, the apples and nuts are healthy carbs/calories. You can peel the apples, but it is not really necessary. I wash and quarter the apples and core them. Then I slice each quarter into four or five slices – but stop just before reaching the end so they are still fastened together. Quickly cut evenly across and the full length of the slices. You’ll end up with long even bits of apple with just a tiny bit of peel on one end. Not worth the time to peel for me. Mix the dry pudding mix directly into the apples, coating them well. Add the pecans. You can also used dry roasted peanuts when there is a shortage of pecans and prices are sky high – or just because you like them. We prefer pecans. Add the crushed pineapple and its juice, just as it is in the can, to the pudding coated apples and nuts. Stir thoroughly. Be sure there is no dry pudding visible anywhere. Then fold in the whipped topping, cover and refrigerate, overnight is best but at least two hours, before serving. I thought the bowl looked a little plain the first time so I added a bit of caramel sauce drizzled over the top and sprinkled a couple of tablespoons of toffee bits over it all. In honor of National Salad Month here are a few more salads you might want to try: Layered Salad, Chicken Curry and Fruit Salad, Fruity Cranberry Relish and Bacon Potato Salad. 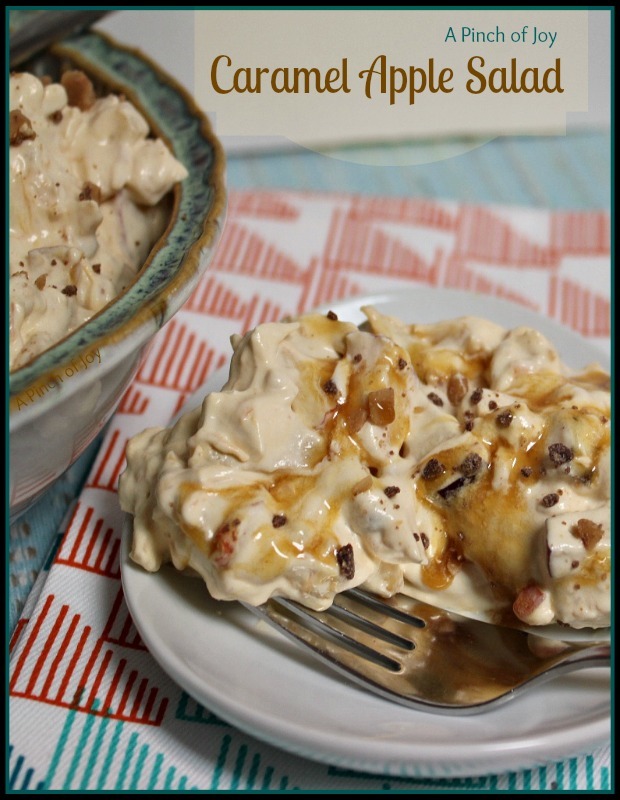 A creamy, caramelly salad starring fresh apples and pecans! Peel apples, if desired. Quarter and core, then dice or chop. Add dry butterscotch pudding mix to chopped apples. Stir thoroughly to coat apples. Add pecans and crushed pineapple. Mix well. Be sure to follow A Pinch of Joy so you don’t miss a thing! Subscribe by email or RSS, follow on facebook or twitter using the blue buttons on the header! If you found this helpful, please share on your favorite network by clicking one of the buttons on the bottom of this post. I’m so glad you stopped by today! I just love this salad. Thank you for posting it. Your Caramel Apple Salad is just like a wonderful dessert. Thank you so much for sharing with Full Plate Thursday and have a fabulous weekend. This sounds so good. I pinned it, but I’d love it if you would bring this over to my Saturday Spotlight party to share. http://angelshomestead.com/saturday-spotlight-19/ Hope to see you there! ooo yep, that looks amazing!!! Have you seen the offer for a free fathers day card from TREAT? I’ve posted the details on my blog and it really is free! No tricks :o) Just trying to pass along the offer! Lisa @ Flour Me With Love recently posted…Mix it up Monday! This looks crazy decadent (yay!) and delicious! Thanks for your comment about the Uganda dresses. It would be so cool to see pictures of all the girls in the colorful dresses. We are looking for other charitable projects if you find any please send our way! Now that we understand link back we will always do that! You had me at caramel apple! That looks and sounds amazing!